← SDCC Exclusive Pullips revealed Pullips Wonder Woman & Harley Quinn Dress Versions also now available for preorder! 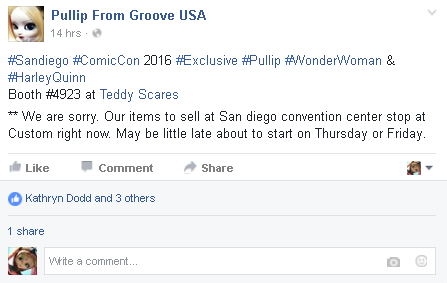 JPGroove posted a little bit of an update on their upcoming SDCC dolls Pullips Harley Quinn and Wonder Woman via their facebook page . You can read more about them in detail here if you missed it. So the dolls may not clear customs in time to actually be sold at SDCC but Groove will still be there and the product samples will at least be on display I imagine. 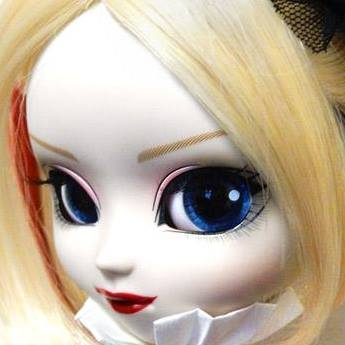 JPGroove also posted a close up of the new Harley Quinn Pullip without the mask hiding her pretty face! After closer inspection it does appear that well the elements of the face up are mostly the same it does appear that she has some additional pink/red eyeshadow compared to the original and seems like she may have more streaks than the promotional photos led me to believe. 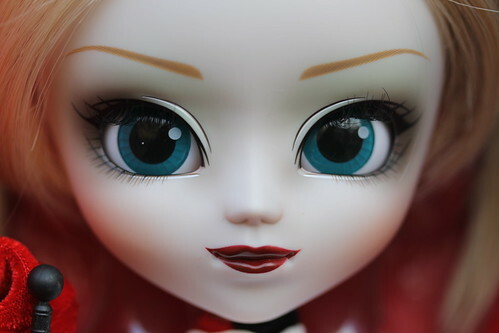 Here’s a close up of the original Pullip Harley Quinn’s face up for comparison, the eye chips have definitely been changed. I unfortunately now want the new Harley Quinn Pullip now more than ever, we shall see what I can do! As a reminder, both Wonder Woman and Harley Quinn are also available to preorder via JPGroove’s website here. This entry was posted in Doll, Pullip and tagged dc comics, harley quinn, Pullip, pullip x DC comics, sdcc, wonder woman. Bookmark the permalink.